Not to be confused with Western Canadian Inuktitut. Inuktitut (/ɪˈnʊktɪtʊt/; Inuktitut: [inuktiˈtut], syllabics ᐃᓄᒃᑎᑐᑦ; from inuk, "person" + -titut, "like", "in the manner of"), also Eastern Canadian Inuktitut, is one of the principal Inuit languages of Canada. It is spoken in all areas north of the tree line, including parts of the provinces of Newfoundland and Labrador, Quebec, to some extent in northeastern Manitoba as well as the Northwest Territories and Nunavut. It is one of the aboriginal languages written with Canadian Aboriginal syllabics. It is recognised as an official language in Nunavut alongside Inuinnaqtun, and both languages are known collectively as Inuktut. Further, it is recognized as one of eight official native tongues in the Northwest Territories. It also has legal recognition in Nunavik—a part of Quebec—thanks in part to the James Bay and Northern Quebec Agreement, and is recognised in the Charter of the French Language as the official language of instruction for Inuit school districts there. It also has some recognition in Nunatsiavut—the Inuit area in Labrador—following the ratification of its agreement with the government of Canada and the province of Newfoundland and Labrador. The Canadian census reports that there are roughly 35,000 Inuktitut speakers in Canada, including roughly 200 who live regularly outside traditionally Inuit lands. The term Inuktitut is often used more broadly to include Inuvialuktun and thus nearly all the Inuit dialects of Canada. Before contact, Inuit learned skills by example and participation. The Inuktitut language provided them with all the vocabulary required to describe traditional practices and natural features. Up to this point, it was solely an oral language. Colonialism brought the European schooling system over to Canada. The missionaries of the Anglican and Roman Catholic churches were the first ones to deliver education to Inuit in schools. The teachers used the Inuktitut language for instruction and developed writing systems. In 1928 the first residential school for Inuit opened, and English became the language of instruction. As the government's interests in the North increased, it started taking over the education of Inuit. After the end of World War II, English was seen as the language of communication in all domains. Officials expressed concerns about the difficulty for Inuit to find employment, if they were not able to communicate in English. Inuit were supposed to use English at school, work, and even at the playground. The Inuit themselves viewed Inuktitut as the way to express their feelings and be linked to their identity, while English was a tool for making money. In the 1960s, the European attitude towards the Inuktitut language started to change. Inuktitut was seen as a language worth preserving, and it was argued that knowledge, particularly in the first years of school, is best transmitted in the mother tongue. This set off the beginning of bilingual schools. In 1969, most Inuit voted to eliminate federal schools and replace them with programs by the Direction Generale du Nouveau-Quebec (DGNQ). Content was now taught in Inuktitut, English and French. Inuktitut became one of the official languages in the Northwest Territories in 1984. Its status is secured in the Northwest Territories Official Language Act. With the split of the Territory into NWT and Nunavut in 1999, both territories kept the Language Act. Nunatsiavut in Labrador made Inuktitut the official language of the government. In Nunavik, the James Bay and Northern Quebec Agreement recognizes Inuktitut in the education system. Nunavut's basic law lists four official languages: English, French, Inuktitut and Inuinnaqtun, but to what degree Inuktitut and Inuinnaqtun can be thought of as separate languages is ambiguous in state policy. The word Inuktitut is often used to describe both. A more proper term has been adopted using "Inuit Languages" when speaking of Inuinnaqtun and Inuktitut. The demographic situation of Inuktitut is quite strong in Nunavut. Nunavut is the home of some 24,000 Inuit, most of whom—over 80% according to the 2001 census—speak Inuktitut, including some 3,500 people reported as monolinguals. 2001 census data shows that the use of Inuktitut, while lower among the young than the elderly, has stopped declining in Canada as a whole and may even be increasing in Nunavut. The South Baffin dialect (Qikiqtaaluk nigiani, ᕿᑭᖅᑖᓗᒃ ᓂᒋᐊᓂ) is spoken across the southern part of Baffin Island, including the territorial capital Iqaluit. This has in recent years made it a much more widely heard dialect, since a great deal of Inuktitut media originates in Iqaluit. Some linguists also distinguish an East Baffin dialect from either South Baffin or North Baffin, which is an Inuvialuk dialect. As of the early 2000s, Nunavut has gradually implemented early childhood, elementary, and secondary school-level immersion programmes within its education system to further preserve and promote the Inuktitut language. As of 2012[update], "Pirurvik, Iqaluit's Inuktitut language training centre, has a new goal: to train instructors from Nunavut communities to teach Inuktitut in different ways and in their own dialects when they return home." Quebec is home to roughly 12,000 Inuit, nearly all of whom live in Nunavik. According to the 2001 census, 90% of Quebec Inuit speak Inuktitut. The Nunavik dialect (Nunavimmiutitut, ᓄᓇᕕᒻᒥᐅᑎᑐᑦ) is relatively close to the South Baffin dialect, but not identical. Because of the political and physical boundary between Nunavik and Nunavut, Nunavik has separate government and educational institutions from those in the rest of the Inuktitut-speaking world, resulting in a growing standardization of the local dialect as something separate from other forms of Inuktitut. In the Nunavik dialect, Inuktitut is called Inuttitut (ᐃᓄᑦᑎᑐᑦ). This dialect is also sometimes called Tarramiutut or Taqramiutut (ᑕᕐᕋᒥᐅᑐᑦ or ᑕᖅᕐᕋᒥᐅᑐᑦ). Subdialects of Inuktitut in this region include Tarrarmiut and Itivimuit. Itivimuit is associated with Inukjuak, Quebec, and there is a Itivimuit River near the town. The Nunatsiavut dialect (Nunatsiavummiutut ᓄᓇᑦᓯᐊᕗᒻᒥᐅᑐᑦ , or often in government documents Labradorimiutut) was once spoken across northern Labrador. It has a distinct writing system, created by German missionaries from the Moravian Church in Greenland in the 1760s. This separate writing tradition, and the remoteness of Nunatsiavut from other Inuit communities, has made it into a distinct dialect with a separate literary tradition. The Nunatsiavummiut call their language Inuttut (ᐃᓄᑦᑐᑦ). Although Nunatsiavut claims over 4,000 inhabitants of Inuit descent, only 550 reported Inuktitut to be their native language in the 2001 census, mostly in the town of Nain. Inuktitut is seriously endangered in Labrador. Nunatsiavut also had a separate dialect reputedly much closer to western Inuktitut dialects, spoken in the area around Rigolet. According to news reports, in 1999 it had only three very elderly speakers. Though often thought to be a dialect of Greenlandic, Inuktun or Polar Eskimo is a recent arrival in Greenland from the Eastern Canadian Arctic, arriving perhaps as late as the 18th century. Eastern dialects of Inuktitut have fifteen consonants and three vowels (which can be long or short). Consonants are arranged with five places of articulation: bilabial, alveolar, palatal, velar and uvular; and three manners of articulation: voiceless stops, voiced continuants and nasals, as well as two additional sounds—voiceless fricatives. Natsalingmiutut has an additional consonant /ɟ/, a vestige of the retroflex consonants of Proto-Inuit. Inuinnaqtun has one fewer consonant, as /s/ and /ɬ/ have merged into /h/. All dialects of Inuktitut have only three basic vowels and make a phonological distinction between short and long forms of all vowels. In Inuujingajut—Nunavut standard Roman orthography—long vowels are written as a double vowel. /ɡ/ is always a fricative [ɣ] in Siglitun. In other dialects, the fricative realization is possible between vowels or vowels and approximants. Inuktitut, like other Eskimo–Aleut languages, has a very rich morphological system, in which a succession of different morphemes are added to root words to indicate things that, in languages like English, would require several words to express. (See also: Agglutinative language and Polysynthetic language.) All words begin with a root morpheme to which other morphemes are suffixed. Inuktitut has hundreds of distinct suffixes, in some dialects as many as 700. However, it is highly regular, with rules that do not have exceptions like in English and other Indo-European languages, though they are sometimes very complicated. Inuktitut is written in several different ways, depending on the dialect and region, but also on historical and political factors. Moravian missionaries, with the purpose of introducing the Inuit peoples to Christianity and the Bible, contributed to the development of an Inuktitut alphabet in Greenland during the 1760s that was based on the Latin script. (This alphabet is distinguished by its inclusion of the letter kra, ĸ.) They later travelled to Labrador in the 1800s, bringing the Inuktitut alphabet with them. The Alaskan Yupik and Inupiat (who, in addition, developed their own syllabary) and the Siberian Yupik also adopted Latin alphabets. Eastern Canadian Inuit were the last to adopt the written word when, in the 1860s, missionaries imported the written system Qaniujaaqpait they had developed in their efforts to convert the Cree to Christianity. The very last Inuit peoples introduced to missionaries and writing were the Netsilik Inuit in Kugaaruk and north Baffin Island. The Netsilik adopted Qaniujaaqpait by the 1920s. The "Greenlandic" system has been substantially reformed in recent years, making Labrador writing unique to Nunatsiavummiutut at this time. 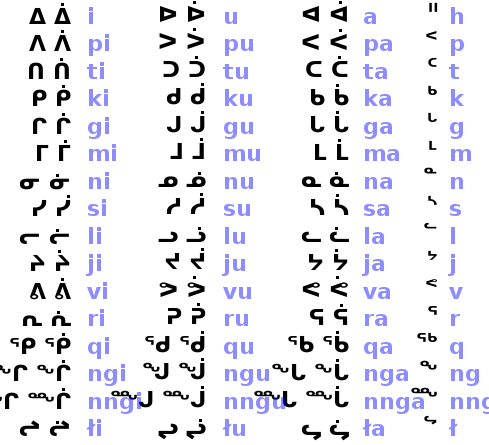 Most Inuktitut in Nunavut and Nunavik is written using a scheme called Qaniujaaqpait or Inuktitut syllabics, based on Canadian Aboriginal syllabics. The western part of Nunavut and the Northwest Territories use a Latin alphabet usually called Inuinnaqtun or Qaliujaaqpait, reflecting the predispositions of the missionaries who reached this area in the late 19th century and early 20th. In April 2012, with the completion of the Old Testament, the first complete Bible in Inuktitut, translated by native speakers, was published. Noted literature in Inuktitut has included the novels Harpoon of the Hunter by Markoosie Patsauq, and Sanaaq by Mitiarjuk Nappaaluk. The Inuktitut syllabary used in Canada is based on the Cree syllabary devised by the missionary James Evans.The present form of the syllabary for Canadian Inuktitut was adopted by the Inuit Cultural Institute in Canada in the 1970s. The Inuit in Alaska, the Inuvialuit, Inuinnaqtun speakers, and Inuit in Greenland and Labrador use Latin alphabets. All of the characters needed for the Inuktitut syllabary are available in the Unicode block Unified Canadian Aboriginal Syllabics. The territorial government of Nunavut, Canada, has developed TrueType fonts called Pigiarniq (ᐱᒋᐊᕐᓂᖅ [pi.gi.aʁ.ˈniq]), Uqammaq (ᐅᖃᒻᒪᖅ [u.qam.maq]), and Euphemia (ᐅᕓᒥᐊ [u.vai.mi.a]) for computer displays. It was designed by Vancouver-based Tiro Typeworks. Apple Macintosh computers include an Inuktitut IME (Input Method Editor) as part of keyboard language options. In 2012 Tamara Kearney, Manager of Braille Research and Development at the Commonwealth Braille and Talking Book Cooperative, developed a Braille code for the Inuktitut language syllabics. This code is based on representing the syllabics orientation. Machine translation from Unicode UTF-8 and UTF-16 can be performed using the liblouis Braille translation system which included an Inuktitut Braille translation table. The book ᐃᓕᐊᕐᔪᒃ ᓇᓄᕐᓗ (The Orphan and the Polar Bear) became the first work ever translated into Inuktitut Braille and a copy is held by the Nunavut Territorial Library at Baker Lake, Nunavut. ^ "Census in Brief: The Aboriginal languages of First Nations people, Métis and Inuit". Statistics Canada. Retrieved 2017-11-12. ^ Hammarström, Harald; Forkel, Robert; Haspelmath, Martin, eds. (2017). "Eastern Canadian Inuktitut". Glottolog 3.0. Jena, Germany: Max Planck Institute for the Science of Human History. ^ "field to show translation -> 10 facts about Canadian Aboriginal Languages". Wintranslation.com. 2014-02-12. Retrieved 2015-07-15. ^ a b Dorais, Louis-Jacques (2010). The language of the Inuit : syntax, semantics, and society in the Arctic. Montreal: McGill-Queen's University Press. ISBN 9780773544451. OCLC 767733303. ^ a b Dorais, Louis-Jacques (1995). "Language, culture and identity: some Inuit examples". Canadian Journal of Native Studies. 15 (2): 129–308. ^ Fabbi, Nadine (2003). "Inuktitut – the Inuit Language" (PDF). K12 Study Canada. Retrieved March 15, 2018. ^ a b Patrick, Donna (1999). "The roots of Inuktitut-language bilingual education". The Canadian Journal of Native Studies. XIX, 2: 249–262. ^ Compton, Richard. "Inuktitut". The Canadian Encyclopedia. Retrieved 2018-03-15. ^ Dawson, Samantha (2013-01-17). "A new way to nurture the Inuit language: train the instructors". NunatsiaqOnline. Archived from the original on 2013-02-08. Retrieved 2013-01-24. ^ "Review". Arctic.synergiesprairies.ca. Archived from the original on 2014-02-24. Retrieved 2015-07-15. ^ "A precious Inuktitut dialect slowly dies in Rigolet". Nunatsiaq.com. 1999-05-07. Archived from the original on 2007-10-29. Retrieved 2012-06-13. ^ Dench, Catherine; Cleave, Patricia L.; et al. (2011). "The Development of an Inuktitut and English Language Screening Tool in Nunavut" (PDF). Canadian Journal of Speech-Language Pathology and Audiology. 35 (2): 168–177. Archived (PDF) from the original on 2015-09-22. Retrieved 2015-08-03. ^ "MARKOOSIE, 1942-: LMS-0017". Collections Canada. ^ Martin, Keavy (17 January 2014). "Southern readers finally get a chance to read Mitiarjuk Nappaaluk, the accidental Inuit novelist". The Globe and Mail. Retrieved 18 October 2014. Mallon, Mick. "Inuktitut Linguistics for Technocrats". Inuktitutcomputing.ca. Mallon, Mick (1991). Introductory Inuktitut. ISBN 0-7717-0230-2. Spalding, Alex (1998). Inuktitut: A multi-dialectal outline dictionary (with an Aivilingmiutaq base). ISBN 1-896204-29-5. Archived from the original on 2013-01-01. Spalding, Alex (1992). Inuktitut: a Grammar of North Baffin Dialects. ISBN 0-920063-43-8. "The Inuktitut Language". Project Naming | the identification of Inuit portrayed in photographic collections at Library and Archives Canada. Collectionscanada.ca. Archived from the original on 2006-10-28. "Arctic Languages: An Awakening" (PDF). (2.68 MB), ed: Dirmid R. F. Collis. ISBN 92-3-102661-5. Wikivoyage has a phrasebook for Inuktitut. NANIVARA – Inuktitut Search Engine. – NANIVARA means "I've found it!" in Inuktitut.